A Sustainable Mission for Context Driven Testing? This image changed the world. 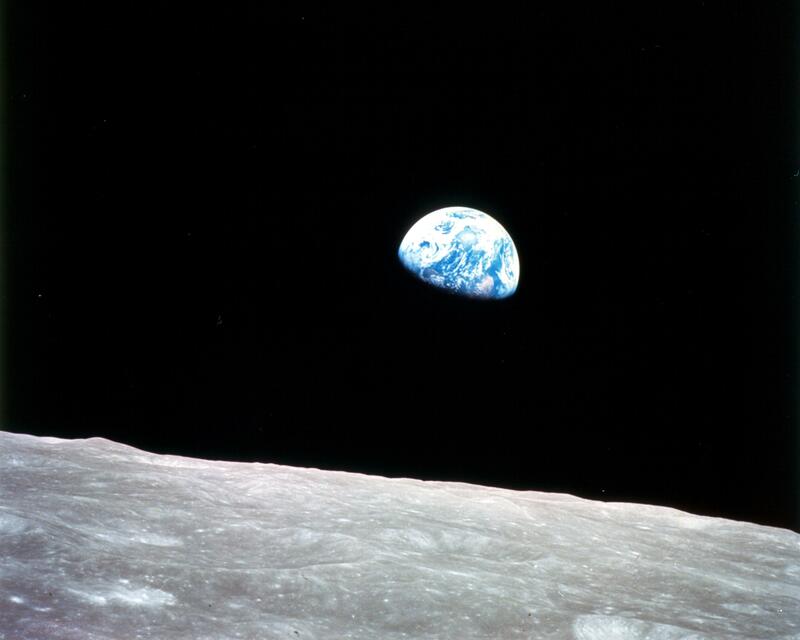 It was taken from Apollo 9 in 1968: “The vast loneliness is awe-inspiring and it makes you realize just what you have back there on Earth,” astronaut Command Module Pilot Jim Lovell said. Image credit: NASA. I have lately become worried about certain developments in society. For years, scientists, politicians and others have warned us that we’re responsible for irreverisble changes to our planet: Climate changes, most notably. They’re telling us we need to change to sustainable energy sources. Sustainability is about more than energy, and I’m worried that in the society changes imposed upon us by the combined effects of globalization and the need for serious resource conservation, we are at the same time becoming increasingly indifferent about the lives of certain groups of people. I remember how many used to be develop deep feelings of indignation when pictures of hungry or poor children were shown on tv. It has changed and such pictures don’t have much effect any more. And worse: We genrally don’t even care about poverty close to ourselves. I feel this may be linked to a macroeconomic pattern we’re seeing almost everywhere in the world: The rich are getting richer, but the poor are still as poor as they used to be. In Southern Europe, we have enormous unemployment among young people. Economists are raising a warning that we are about to loose a whole generation. Does this affect testers too? After all we’re safe, working in IT, technology of the future? Well inequalities in income and life conditions are growing on our planet, and this is worrying, since inequality has historically been a trigger of wars and revolutions, and has always been damaging to democracy and society as a whole. So yes, I think we have very good reasons to be worried about the future for ourselves, our families and for our societies. James Bach recently published a blog post which has inspired me. Testing is a performance, not an artifact, he says. It made me think about how I differentiate the great testing performance from the poor performance. Is it only a subjective measure (aka ”the music performance was good”), or could there be some objective measures in play? I think we should judge the testing performance by the artefacts it produces: Knowledge artefacts which are valuable in the business context in which we’re testing, income artefacts to me as a tester, and entertainment artefacts (testing is fun). But I’ve realised that there is something missing: The performance should also be judged by its contribution to society as a whole. Testing should somehow contribute to sustainability in order to be a meaningful profession for me, social sustainability as well as energy and materialistic sustainability. This can be taken as a strictly political point of view, and I could choose to execute it by only accepting jobs in socially responsible companies and in organisations and comapnies which are making sustainable products. But it can also be seen as a mission for our craft as a whole. Like science itself has had to face the fact that it is not just a knowledge producing activity, but has to face the fact that it is changing society by the knowledge it is producing, we as testers also have to face the fact that the knowledge we are producing is applied by certain ways. Being a responsible tester does not mean that I’m only responsible for testing. Therefore, I think that we should take on the endavour to develop our craft from being just a knowledge producing performance, to be a wisdom producing performance. There is thus, I claim, a major intellectual disaster at the heart of western science, technology, scolarship and education – at the heart of western thought; and this long-standing intellectual disaster has much to do with the himan disasters of our age, our incapacity to tackle more himanely and successfully our present world-wide problems. In order to develop a saner, happier, more just and humane world it is certainly not a sufficient condition that we have an influential tradition of rational inquiry devoted to helping us achieve such ends. It is, however, I shall argue, a necessary condition. In the absense of such a tradition of thought, rationally devoted to helping us solve our problems of living, we are not likely to resolve these problems very successfully in the real world. It is this which makes it a matter of such proound intellectual, moral and social urgency, for all those in any way concerned with the academic enterprise, to develop a kind of inquiry more rationally devoted to helping us resolve our problems of living than that which we have at present. Should this apply testing, as well as “science, technology, scolarship and education”? Yes, it certainly should. Will it be easy to adopt this thinking in testing? No, not at all. First of all, we shouldn’t start throwing away any of the good things we’ge learnt and developed. Like the ”scientific method” is still a necessary but not suffucient condition for the progress of science, our values and ideas about great testing are still all-important in testing. They are just not sufficient. I think we who belong to the Context Driven Testing school are far better equipped than other testing schools to accept the sustainability point of view. After all, we’re already successful developing testing into a sustainable performance. Other testing schools still struggle with their explicit or implicit underlying short-term profit-making ambitions. And although we’re obviously playing a polyfonic music piece, speaking many voices, not saying or meaning exactly the same about testing or CDT, it seems to me that everyone in the CDT school share the mission of developing testing as a craft as a creative, value producing performance, where value is what matters to stakeholders of the product under test. Let me call this our shared mission. This is a wonderful mission, but in the new context, it has to give way for a better one: We’re only percieving the craft of testing in isolation or in its immediate context, and we have to raise our heads and relate our craft to the greater context of society. So I propose that we in the Context Driven School adopt the mission to develop testing towards being a wisdom enhancing performance, where wisdom is knowledge that helps build a sustainable society.